Since 1959, the museum has offered exhibits that cover a wide variety of real life experiences from the Illinois Valley from the turn of the century. The Kerbyville Museum displays a fine collection of pioneer artifacts, presented in an historic turn of the century house. Of special interest is an exhibit of early day Native Americans basketry, grinding tools and stones, blankets, arrow and spear points, pottery and many other artifacts. This is a colorful display, not to be overlooked, and to realize, the beautiful colors used were made from herbs and roots by these Indians of long ago. The building housing Kerbyville Museum was erected by Frank Stith in the 1870's. Sucker Creek School District #41 was organized in 1898 and the log building, built on William Grimmetts's homestead was named Grimmett School. Open May 15 thru September 15 and the rest of the year by appointment. 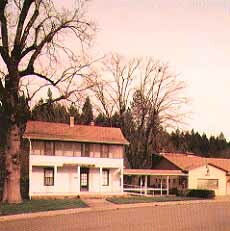 This is just one of the many Historical Museums located throughout Oregon.